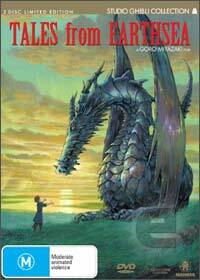 Tales from Earthsea is the epic anime DVD tale directed by Goro Miyazaki (Spirited Away, Howl's Moving Castle) that is set on a mythical world of sword, sorcery and dragons. Adapted from Ursula K. LeGuin's Earthsea novels, Miyazaki does a brilliant directorial job at keeping to the original story intact yet putting his own unique spin on the tale. When dragons from the west are spotted over the eastern oceans, it brings a foreboding doom for the denizens of the world with a dark omen. Fortunately, Ged, an archmade has taken on the quest to resolve this dark omen and on his travels, he is met by Prince Arren of Enlad where they travel through a land that is filled with both good and evil. Tales of Earthsea has some big Hollywood names to grace the movie which stars Timothy Dalton as Ged, Matt Levin as Prince Arren, Mariska Hargitay as Tenar and even Cheech Marin as Usagi. The DVD is also presented in glorious 5.1 Dolby Digital with a glorious soundtrack that is only fitting for an epic movie of this genre. The animation of Tales of Earthsea fits the genre perfect with its simplistic animation styles and varied colour palette. The battles and special effects of the movie really help distance the story from other similar movies of the genre and Miyazaki does a remarkable job at translating the movie from words to animation. In conclusion, Tales of Earthsea is your classic sword and sorcery tale that will appeal to lovers of the RPG genre, Harry Potter or The Lord of the Rings. Match that with great animation and a variety of special features and there's little complain about this DVD.